politic, poetry, linguistics and education. 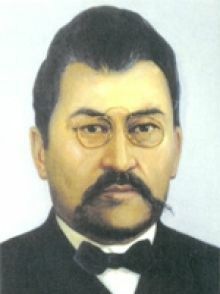 Akhmet Baytursinuli (Kazakh: Ахмет Байтұрсынұлы; Russian: Ахмет Байтурсынов) (January 28, 1873 — December 8, 1937) was a Kazakh intellectual who worked in the fields of politic, poetry, linguistics and education. Baytursinuli was born in what is today Kostanay Province, and was educated at the Orenburg Teachers' School. After graduating in 1895, Baitursynov held teaching positions in a number of cities in Kazakhstan, including Aktobe, Kostanay and Karkaralinsk. The same year as his graduation, Baytursinuli published his first article, "Kirgizskie primety i poslovitsy" ("Kazakh Omens and Proverbs") in a regional newspaper. While living in Ural city in 1905, he collaborated with other Kazakhs to form the Kazakh wing of the Constitutional Democrat Party. His involvement in politics probably led to his 1909 arrest and exile from the Steppe regions. After being exiled, he went to Orenburg. During his exile, he wrote articles for Ay Qap. He also served as the chief editor of Qazaq, the Kazakh newspaper there, and published "Qyryq Mysal" ("Forty Proverbs"). His other significant publication of this time was a Kazakh translation of Ivan Krylov's fables. In 1911, Baytursinuli published his first work of a distinctly political nature — Masa ("Mosquito"). When the Russian Revolution of 1917 occurred, Baytursinuli returned to the steppes and began to work with the Alash Orda political party. With them, he fought for the Kazakhs to have an independent state. He began to work with the Bolsheviks in 1920 when they established their dominance over the region. He served as a Member of the Committee of Deputies of the Constituent Assembly and as Deputy Chairman of the Revolutionary Committee of the Kazakh Krai, as well as Commissioner of Enlightenment. In these capacities, he helped to reform education and to establish the first university in Kazakhstan. Another of Baytursinuli's significant accomplishments was his adaptation of Arabic script for the Kazakh alphabet. However, in 1937, Baytursinuli was arrested for hiding "bourgeois nationalist sentiments" and summarily executed. This had resulted in an outcry, which was quickly and bloodily silenced. To this day, he is held in great regard in Kazakhstan, but is viewed as somewhat tragic figure, signifying the extent of the numbers of authors, poets and thinkers who have perished due to the Soviet repressions. Baytursinuli's work is part of the curriculum for high school education system of Kazakhstan.